Urban governance is as much about infrastructure as it is about people and processes. In particular, the history of urban governance is closely intertwined with the history of urban water services. Historically, as urban areas became larger and more densely inhabited, the collective need for better water services (drinking water, sanitation and flood protection in particular) became overwhelming. Cities simply could not grow beyond a certain relatively modest size without the simultaneous articulation of an integrated water services infrastructure to replace the piecemeal local arrangements previously in place. This necessarily implied new and more complex governance arrangements, in this case the institutionalisation of water services management in functional departmental structures, linked to political decision-making, finance, quality assurance and related functions. Whilst other papers have presented case studies of the urban hydrosocial transition (UHT) in terms of the physical extension of water services (e.g. water supply, sanitation and surface water management), this chapter focuses specifically on urban governance of water. We argue that the progressive breakdown of Fordist neo-corporatism in water services has opened up the field to a proliferation of ‘glocal’ (to use Swyngedouw’s useful neologism) governance arrangements. Whilst integrated water resource management (IWRM) principles imply a supra-urban scale of governance, the fact that urbanisation brings with it local concentration of water-related impacts means that there is an ineluctable local and urban dimension to water governance. It is therefore not surprising that cities around the world are asserting themselves as central players in water governance. Brief case studies from around the world are presented by way of illustration. The development and extension of water services infrastructure has been a key foundational element of industrialisation and urbanisation since at least the ‘Great Sanitary Awakening’ of the mid-nineteenth century. As urban areas became both larger and more densely inhabited, the collective need for better water services (drinking water, sanitation and flood protection in particular) became overwhelming. Cities simply could not grow beyond a certain relatively modest size without the simultaneous articulation of an integrated water services infrastructure to replace the piecemeal local arrangements then in place, a reality amply demonstrated by Dr. John Snow’s intervention during the 1854 cholera epidemic in London. The mid-twentieth-century completion (in Europe, North America and parts of Australasia) of the resulting project of mass provision of standardised water supply and sanitation services, what we have elsewhere (Staddon 2010; Staddon and Langberg 2014) called ‘hydromodernism’, was then followed by several waves of restructuring in the water services value chain, based particularly on new ideas about the respective roles of the public and private sectors, new technologies and burgeoning recognition of the water needs of the natural environment. Unfortunately, in much of the developing world, even ‘hydromodernism’ is as yet unattained and perhaps unattainable. In addition, too-rapid urbanisation in many developing nations has gone hand in hand with the growth of what are called ‘peri-urban’ areas that combine urban and rural characteristics and present new challenges to water (and other) services provision (Harris et al. 2013; McGee 2002; Tacoli 2006). Despite concerted international efforts in recent decades, there are still at least a BILLION people in the developing world without adequate access to basic water services. A typical pattern, exemplified by Kampala, Uganda, involves a very limited extent of piped drinking water and sewerage interconnection to urban households (classic ‘hydromodernism’), with the vast majority depending on expensive private water sellers, local water collection (often undertaken by children) and defecation in pit latrines and/or in the open. Dr. Snow would be horrified by the high level of water services insecurity prevailing in many twenty-first-century cities around the world. Fortunately there is a way of easily presenting the historical progression from a low level of water services to a higher level, and the governance arrangements needed to bring it about. It is also possible to indicate the key drivers of water services development. Cities around the world can be understood from the point of view of their location within the ‘urban hydrosocial transition’ (UHT), a historical geographical framework that sees cities as manifestations of successive ‘hydrosocial contracts’ between agents of economic, political, cultural and technological change. This concept builds on work undertaken by Brown and Morison (2011) and Brown et al. (2009) on ‘water-sensitive cities’ (also Lundqvist et al. 2001), Turton and Meissner (2002) on the ‘hydrosocial contract’, Swyngedouw (2005) on ‘urban metabolism’ and Thapa et al. (2014) on ‘water security indices’. A key innovation offered here is the simplified three-part historical geographical schema based on a limited number of readily available key indicators and associated drivers, including models of urban water governance. Whilst other papers (e.g. Staddon and Langberg 2014) have presented case studies of the UHT in terms of the physical extension of water services (water supply, sanitation and surface water management), this chapter focuses more on urban-scale governance of water. We argue that the progressive breakdown of Fordist neo-corporatism in water services has opened up the field for a proliferation of ‘glocal’ (to use Swyngedouw’s useful neologism) governance arrangements. Whilst IWRM principles usually imply a supra-urban scale of governance, the fact that impacts are expressed locally and urbanisation brings with it a concentration of water-related impacts means that there is an ineluctable urban dimension to water governance. Conversely, urban governance has a strong water (and public works) dimension. Urban leaders have played a critical role in the development of new models of service delivery in water supply, sanitation, surface water drainage and water-related ecosystems services, even as higher-level ‘apex organisations’ have sought to assert themselves. As the three ‘water-city’ case studies show, there are real challenges in achieving urban-scale system integration between water and services, especially as articulated through development control and land-use planning. Thus analytical attention to changing geographies of urban water governance illuminates much more than the mere particularities of local experience in water services. Brief case studies from around the world are presented by way of illustration. The purpose of this chapter is to introduce the UHT as a way of thinking about the changing relationship between cities, water services and the related institution of urban water governance. In addition to permitting observers to place any given city on a comparative continuum of hydrosocial development, the concept also suggests likely hydrosocial development futures based on attention to the underlying drivers of progress through the UHT. The salience of the UHT concept is illustrated with data from urban exemplars from the developed world (Bristol, UK, and Osaka, Japan) and the developing world (Kampala, Uganda). The scholarly study of water networks has focused mainly on urban areas, following well-known studies of large sociotechnical systems such as electricity (Hughes 1985), transportation (Hall 1969), telecommunications (Hadlaw 2011) and gas (Tarr and Dupuy 1988). These works generally presuppose a static state of natural resources and tend to overemphasise technological innovations as the primary engines of urban change. This approach generally consists of urban case studies of infrastructure development through continuous waves of technological innovation, business model restructuring and changing attitudes about state regulation. Hughes’s (1985) otherwise gripping account of the battle between advocates of DC and AC electricity distribution systems in the eastern US is a good example of this genre. The literature on urban water services is by now large, focusing especially on the study of the local water markets, the consequences of service privatisation (as part of a larger restructuring of the state apparatus) and urban management of the networks and changing urban water cultures (e.g. Barraqué 1998; Brown and Morison 2011; Brown et al. 2009; Jaglin 2004; Molle 2001; Schneier-Madanes 2003; Swyngedouw 2005). However, as with the literature on urban infrastructures, there is a tendency towards either technological or economic determinism. This is an important underpinning to the UHT model because it grounds thinking in acknowledgement of the fact that ‘big’ ideas (e.g. about the relative roles of public and private sectors or about the ‘rights’ of urban citizens to certain services) must always enter into accommodations with pre-existing local conditions (e.g. the pre-existing institutional and geographical structures of water provision in England and Wales prior to privatisation in 1989). In other words, from the mass cholera and typhus epidemics in nineteenth-century European cities, water services infrastructure has developed as a function of the interaction between new technical capabilities (e.g. perfection of sand filtration, invention of chlorination and other disinfection methods, etc. ), the inertia of the pre-existing hydrosocial system (based on paternalistic localism) and the changing attitudes of citizens and government (‘governmentality’) towards the respective roles of public and private sectors in planning, financing and regulating this burgeoning civil infrastructure. Context really does matter – water services governance is both a general and a specific phenomenon. Thus privatisation in England and Wales came at the price of quite strong regulation reflective of prevailing British ideas about state-economy-society relations, a British ‘hydrosocial contract’ if you will. In other places, as is well known, water services privatisation has been less well regulated, reflecting different local conditions and with sometimes disastrous results (Cochabamba, Bolivia, being a particularly poignant example – see Olivera and Lewis 2004). So the UHT depends, ultimately, on the underlying ‘hydrosocial contract’ prevailing in a given place and time. And it is possible to sketch out in greater detail its specific economic, political, technical and environmental characteristics. Table 5.1 depicts some of the key characteristics and drivers of the UHT since the mid-nineteenth century. As nineteenth-century societies really began to urbanise, modernise and democratise, starting in Europe and North America, water services necessarily became an ever larger part of the political ‘conversation’. In the first phase of the UHT, what we call ‘hydro-precarity’, a sense of ‘civic mission’ eventually developed around public health and water services, combining with available technologies and investment capital (public and private) to create what Barraqué calls the ‘more water from further’ hydroengineering principle. Though there are important differences between the urban hydropolitics of, say, early American versus French or Japanese cities, there are also abiding commonalities, most importantly the over-reliance on a technocratic elite of engineers and their (neo)corporatist political allies. This is what makes the systems of Roman Bath and sixteenth-century Plymouth more alike to each other than their nineteenth-century counterparts: similar political economic alliances deploying water services technologies to make the cities of their eras more comfortable for themselves. The idea of a broader public good was still a long way off, notwithstanding the occasional public water supplies offered by (usually) religious institutions. Feudal political systems simply did not include the idea of the irreducible equality of all people, which would be a prerequisite for bearing the cost and administrative burden of extending water services (or any other utility) beyond the aristocratic and burgeoning capitalist classes. As late as the mid-1830s, only a few private companies were in the business of providing water to local customers who could pay, with no onus to provide to poorer residents (Dickinson 1954; Staddon 2010). Not until 1852 did the British Parliament legislate for a uniform, mass public water services system in the capital. The specificity of this new hydrosocial contract can be seen more clearly if we contrast it with the strong sense of public duty that underwrote the more expansive, but disaggregated, systems of public water supply prevailing in Middle Eastern cities through the latter part of the same time period, even in the absence of central mandate or decree (Staddon 2010). We suggest that 1914 is a convenient date attaching to the beginning of the irreversible decline of the first era and the faint beginnings of the second, ‘hydromodernity’. Whilst the old regime does not disappear overnight, it appears that by the outbreak of the First World War, water services systems not just in London but throughout the British Isles (and in Europe and North America) were being developed according to the belief that all should enjoy some standard of water, regardless of ability to pay. Indeed, the urban hygiene movement of the late nineteenth and early twentieth centuries made tutored use of water services a moral obligation. It is surely no coincidence that in the latter part of the nineteenth century, the major technological means to organise and deliver such an ambitious agenda also appeared – necessity, as so often, was the mother of invention. Joseph Bazalgette began his ‘great interceptor sewer’ project in 1859, an iconic project that required a new politics of water services as well as new technologies and new ways of organising capital investment (Halliday 2001). Perfection of slow sand filtration, adoption of chlorine as a purifying additive to drinking water, the proliferation of reservoirs (often underwritten by Acts of Parliament) and the emergence of limited liability companies as the key commercial vehicles for commercial organisation all came about in the second half of the nineteenth century. This hydrosocial contract was however not completed until the passage of the 1945 Water Act which mandated consolidation, and part-nationalisation, of Britain’s water services system. The second phase, ‘hydromodernism’, was characterised by an almost messianic belief in water technologies (especially dams and big engineering works) and the ultimate responsibility of government to provide mass water services. Water services were seen predominantly as functions of large public bureaucracies operating at the urban or regional scales. This hydrosocial contract prevailed well into the 1980s and early 1990s before it was decisively challenged by a new urban hydropolitics, based on a burgeoning distrust of both the technocentrism and the public authority premises upon which hydromodernism rested (at least in Britain). Indeed the shift away from ecological modernism towards a more biocentric value system meant that water services increasingly had to take account of the needs of the natural environment. This new sensitivity to the environmental dimension of water services has emerged at nearly the same moment as the prevailing faith in government as an efficient service provider has faltered. After 1992 a new hydrosocial contract, integrated water resource management (IWRM), was articulated based on the neo-liberal view that environmental and social outcomes could be achieved more efficiently by private providers. In the UK, water services governance underwent a marked transformation just before 1992 as water services companies were privatised in 1989 and the state role recast as one of providing strong economic, quality assurance and environmental regulation of privatised local water services monopolies (Bakker 2003; Staddon 2010). Jamie Linton (2010) points out that this current hydrosocial contract reframes peoples’ relationship with water services in terms of commodification and (financial) exchange relations. Even the names of public oversight bodies in the UK, the ‘Consumer Council for Water’ and ‘Customer Challenge Groups’, now reflect the priority given to water services as commercial exchange. However, for our purposes here we focus not on the outward quantitative measures of urban water services transitions but on the underlying social, economic and (especially) political processes. In the case studies that follow (drawn from a rapidly accumulating set of case studies currently being developed through the International Water Security Network – www.watersecuritynetwork.org), we will concentrate our attention on critical shifts in the drivers identified in Table 5.1. As noted above, the three case studies were chosen specifically with a view to highlighting contrasts in the approaches to urban water governance. The city of Bristol, England, is (in British terms) a middle-sized city of approximately 400 000 people. Even as late as the early 1980s, traditions of locally or regionally focused heavy industry and engineering were economically dominant, though these have suffered greatly from cheaper overseas competition, and secondary manufacturing has now largely disappeared. By 2014 Bristol was a very different sort of place, dependent now on high-value engineering (especially in aerospace), higher education (it is home to two major universities and numerous further education colleges) and financial management (banking, insurance and investment services). Gross value added per employed person and rates of tertiary education are amongst the best in Britain although there are significant geographical pockets of social and economic deprivation, especially in the Southmead, Easton and Lawrence Hill wards of the central city. 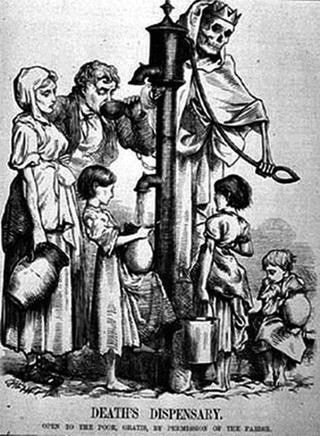 The cholera, typhus and diarrhoea epidemics of the mid-nineteenth century provided the next great push for improved water services. With citizens, especially poorer ones, dying in their tens of thousands, social reformers such as the Webbs, Edwin Chadwick and Sir Joseph Bazalgette began the process of transforming England’s ancient and ill-adapted water and sewerage systems into something fit for purpose (Fig. 5.1). At this time the first comprehensive legislation to monitor and manage public infrastructure, the 1848 Public Health Act, was passed. Although its requirements would not become mandatory until 1875, after this time local authorities had a formal duty to provide (minimal) water supply and sewerage and to monitor public health. In Bristol, the actions of Dr. William Budd, founder director of Bristol Water Corporation and a medical researcher much influenced by the seminal work of Dr. John Snow in London, were central to the early development of a systematic water services network for the city. This systematic water services infrastructure was initiated in 1846 when the Bristol Waterworks Company (now Bristol Water) was created to develop and manage a uniform public water services network for the burgeoning city. The first of the Barrow reservoirs (the so-called ‘line of works’) was commissioned in 1850, the Blagdon Reservoir in 1888 and the Cheddar Reservoir in 1922. By 1898 the company was supplying a daily average of 22 gallons (about 100 litres) per person – a level of supply many twenty-first-century providers around the world even now fail to achieve. The Littleton and Sharpness schemes, located to the north of the city, plumbed Bristol into the Severn River (one of Britain’s largest rivers) in the 1950s and remains central to the city’s water services security. Currently Bristol Water supplies customers with approximately 300 megalitres (ML) of drinking water per day, drawn largely from these main sources. With respect to wastewater management, advances in technology in the nineteenth century combined with increasing certainty about the causal link between exposure to contaminated water and illness to create both the technical means to act and the political will to do so. From mid-century Metropolitan Boards of (Public) Works, often led by physicians and public health specialists such as Doctors Snow and Budd, were formed in most major British cities. These Boards organised civic investment in wastewater collection and transport pipe networks towards water treatment works on the fringes of cities.1 Sand filtration and other kinds of more sophisticated water treatment systems were developed in the first half of the nineteenth century by engineers such as James Peacock, Robert Thom and James Simpson. Indeed Simpson’s ‘slow sand filtration system’ which depends upon the aerobic digestion of sewage wastes by diatoms and green algae growing on the sand surface is still in use in parts of the UK, though now augmented by a wide range of other technologies. Bristol’s MBW managed to successfully broker the transition towards integrated and universal wastewater management (McGrath 1985). 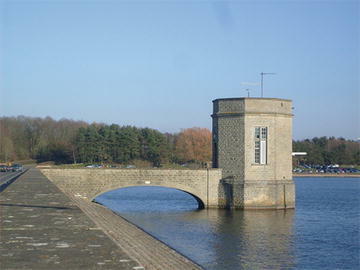 Chew Valley reservoir, located to the south of the city and completed in the early 1950s, is a monument to this ‘big engineering, big government’ form of water services provision (Fig. 5.2). 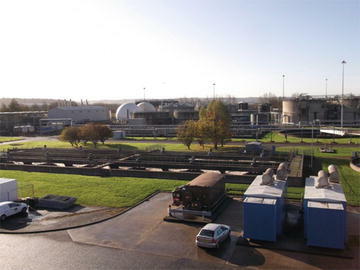 As of 2015, the main Bristol area sewage treatment plant, located at Avonmouth and operated by Wessex Water2, treats most of the sewage generated by the city of Bristol, approximately 210 ML of sewage each day. Plant upgrades and sustainability-orientated changes to the treatment process mean that it now transforms that sewage into its own power (through biogas recovery), agricultural fertiliser (which is given away virtually free of charge) and clean water for release back into the natural environment according to the terms of its licences with the Environment Agency. In fact such is the success of the biogas recovery plant that Wessex Water now imports additional digestible wastes from a variety of sources including other wastewater treatment facilities in the region (Fig. 5.3). From the point of view of transitions in urban water governance, there are three key things to note. First, the shift from phase 1 to phase 2 was largely completed by 1914, when virtually 100 % of the urban population had some form of reliable water supply and sanitation was considerably improved and water services companies such as the Bristol Waterworks Company had become vertically integrated entities. Both direct measures (percentage population served) and indirect measures (health outcomes as measured in disability-adjusted life-years3 or ‘DALYs’) bear this out. The emergence of central administrative responsibility for public health in the 1840s and 1850s was central to this success. Second, the transition from phase 2 to phase 3 was manifest by the late 1980s when the emphasis began to clearly shift from ‘more water from further’ (to use Barraqué’s felicitous phrase) and ‘more hard engineering’ to more attention to behaviour change, efficiency and the environment. In this transition process, the key drivers of business strategy for both water services companies are more firmly linked to environmental sustainability, horizontal integration with other synergistic services sectors and water demand management. Although there are new responsibilities for local governments in managing especially surface water (under the Flooding and Water Management Act 2010 and the Water Act 2014), governance of water services in England and Wales remains the province of centrally mandated government agencies including the Office of the Water Regulator (Ofwat), the Drinking Water Inspectorate (DWI) and the Environment Agency.4 There are also avenues for local input into water services planning through the so-called Customer Challenge Groups tasked with ensuring that water companies’ business plans reflect customer priorities and willingness to pay for capital and operational improvements. Having started as a centre of the Buganda kingdom, by the late nineteenth century, Kampala had become a centre of colonial administration for British East Africa before becoming the capital of an independent Uganda in 1962. Since independence Uganda has endured frequent spasms of violent conflict and repression, including during the regime of Idi Amin (1971–1979), the Ugandan Civil War (1981–1986), First (1996–1997) and Second (1998–2003) Congo Wars as well as confronted ongoing depredations by the Lord’s Resistance Army between 1987 and 2005. During these periods economic and infrastructure development slowed dramatically across the country. The economy of Uganda remains overdependent on agricultural and horticultural exports although recent discoveries of oil and mineral resources have spurred higher-value industrial development especially in the north of the country. Unlike many other areas of Africa, such as the Sahel and North Africa, Uganda is endowed with significant freshwater resources. Lying within the Nile Basin, about 18 % of the country is covered by rivers, lakes and wetlands, including Lake Victoria, the second largest freshwater lake in the world (UNESCO-WWAP 2006). Kampala’s first piped water and sewerage systems were completed during the colonial period in the 1930s. The construction of new facilities accelerated between 1950 and 1965 under the framework of large national development programmes, though many of these facilities fell rapidly into disrepair in the 1970s. Since independence the city has experienced several periods of rural to urban migration-accelerated population growth, coinciding with periods of relative political calm and economic development. Nonetheless, the lack of rigorous development control and the large influx of rural poor, particularly in the 1990s and 2000s, have created a huge, and largely unmet, demand for water services in the Kampala urban region. By 1990 this urban water infrastructure served less than 10 % of the population with plumbed-in domestic connections (UNESCO-WWAP 2006). Most urban dwellers, like their rural counterparts, remain largely reliant on informal, decentralised systems of water services supply. Though the Millennium Development Goals’ Joint Monitoring Programme considers that more than 80 % of urban Ugandans now enjoy access to an ‘improved’ water source, the same publication notes that less than 20 % have access to piped water. Moreover, Hopewell and Graham (2014) note that it is still the case that fully 10 % of Kampala’s residents spend more than 30 min collecting water for household use each and every day. Most of the city’s water originates to the south in Lake Victoria, is stored in 24 onshore reservoirs and is treated at the Ggaba I (1928), II (1992) and III (2007) water treatment works, all operated by the National Water and Sanitation Company (NWSC). The three plants have an average daily production of 147,955 m3 of drinking water (Directorate of Water Development 2010; MWE 2006). They are designed as conventional urban water systems utilising a first stage of physical separation, consisting of coagulation and flocculation chambers together with clarifiers, a rapid sand filtration second stage and a third stage involving chlorination. In 2011 the Ugandan government announced plans to build a water treatment plant in Katosi that would serve 2.4 million people in and around Kampala and upgrade the Ggaba Treatment Complex (NWSC 2011). Originally set up in 1972 the publically owned NWSC was reorganised in 1995 after passage of The National Environmental Act and given more authority to expand its area of service. Throughout the late 1990s, NWSC began serving, although rather incompletely, cities and towns throughout Uganda. As of 2012 the NWSC had barely 300 000 connections spread across 34 urban areas, with Kampala District alone accounting for nearly 106 000, meaning that most Ugandans do not benefit directly from its services (Directorate of Water Development 2010).5 Whilst NWSC is attempting to extend the number of connections in all its service areas, it acknowledges that a near-universal level of household and business connections (as in European water systems) is not attainable. Thus, water services provision is characterised by a complex hybrid of the ‘hydromodernist’ formal system and myriad ‘informal’ systems, ranging from small-scale water sellers to community-level water supply and management schemes (as mandated in the 1999 Water Act). This hybridity makes Kampala, and Uganda more broadly, quite different from the other two case studies discussed in this chapter. It does not neatly fall into phase 1 or 2 of the UHT but rather juggles geographically uneven development of water provision services (Figs. 5.4 and 5.5). 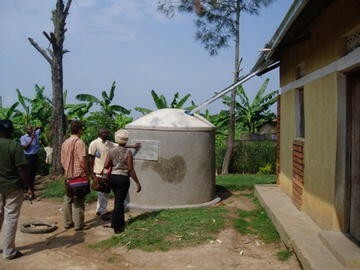 Rainwater harvesting tank: a sustainable approach to hydro-security? In small- and medium-sized towns, the private sector plays a larger role in providing water. In 2006, out of the 143 small towns that had operational piped water supplies and schemes, 57 were managed and operated by private companies. The push to privatise has produced mixed results with some areas of improvement and efficiency offset by areas of abject service failure (Danert et al. 2003). Kampala, with its oscillation between public, private and public-private control of water services as well as the broader countrywide debate over privatisation, exists within the context of an even broader continent-wide search for the balance between public capacity and private sector support. We expect water services in Kampala (and Uganda) to evolve with and perhaps also shape this debate. Though incredibly labour intensive, especially for women and girls, most Ugandans outside the modest service area served by NWSC or local water systems depend on surface water or groundwater collection systems for their domestic needs. The Poverty Eradication Action Plan (PEAP) drafted in 1999 and updated in subsequent years that guides the countrywide economic development strategy devotes a substantial space to discussing the development of water provision services. However, the disparity between urban and rural water services – which creates hybridity – is evident within the document. As of 2004, the PEAP notes that 60 % of urban households had access to an improved water source compared to only 5 % of rural households.6 Even when water is commercially available, it typically consumes up to 22 % of household income making it even more difficult for rural areas to engage in provision centralisation and, in turn, forcing reliance on informal water collection (Ministry of Finance 2004). Though significant progress has been made in improving access to basic water supplies, there are still chronic problems with undersupply and water quality management. In many areas, and supported by the 1999 Water Act and National Water Plan, many communities have developed self-supply systems, based on some combination of groundwater collection and rainwater harvesting (McLaughlin et al. 2014; UNESCO-WWAP 2006). One of the key objectives of the 1999 Water Act is ‘To promote the rational management and use of the waters of Uganda through use of appropriate standards, co-ordination of activities, allocation and delegation of responsibilities’ (MWE 2006; MWLE 1999: 8). A key mechanism for so doing involves the creation of community-level water user committees (WUCs) whose membership is drawn from the beneficiaries of the water supply, tasking them with ensuring the proper maintenance of the water system by collecting revenue from users (Terry et al. 2015). This demonstrates the move from a rights-based to a more market-based system of resource allocation, much in line with IWRM principles declared in 1992. However, whilst handing over responsibility for day-to-day planning and running of water resources to WUCs, the Act also vests all water rights in the government which has therefore become the owner of all water resources in Uganda. Local authorities are required to organise the formation of WUCs within their area, although the responsibility for this task between the district, sub-county or parish is ambiguously drafted within the Act which has added to the confusion. Once created, the WUC is responsible for planning and managing local water services. The poor drafting of the Act is one factor that has made the implementation of better functioning local water supplies less successful than had been expected. The case of Kampala indicates what may turn out to be a common developing world scenario – a form of hybrid ‘hydro-precarity/hydromodernism’ whereby some areas of the urban region have fully modern water services, whilst others, even close by, do not. Also ‘hybrid’ is the complex welter of formal and informal water systems, with significant service gaps and disparities stubbornly manifest in the twenty-first-century city (Poupeau and Hardy 2014). Unfortunately it appears not necessarily to be the case that the two different types of service will necessarily converge over time, as the lagging ‘hydroprecarious’ zones catch up to the more advanced zones. Therefore, a key challenge for both the NWSC and urban government will be the rationalisation and integration of these formal and informal systems into a system providing more comprehensive coverage at a standard level of service. Even more importantly, Uganda needs to translate its rapidly improving policy and institutional framework into improved water services ‘on the ground’. As in Bristol, this will also involve getting to grips with the water services implications of development planning and control – the need for integrated urban water services planning is manifest. The modern city of Osaka grew out of the planned settlement developed around Osaka Castle from the late sixteenth century onwards. This town was built on a grid system, with water supply and sewerage provided by ditches (‘seweri desui’) running behind properties on an east–west line. After the Meiji Restoration in 1868, Japan entered into a period of comprehensive modernisation which also led to modernisation of water supply and sewerage systems. In Osaka, the ‘seweri desui’ and the rest of the city’s rudimentary water services system were modernised starting in the late nineteenth century. During this period accelerated urbanisation and active trading with foreign countries had caused Japan to experience epidemics of waterborne diseases such as cholera and typhus (scourges that were on the wane in Europe by this time) which saw the total number of cases rise to 410 000 by the end of the century. Port cities, beginning with Yokohama in 1887, were thus especially motivated to introduce waterworks infrastructure since these cities were at high risk of outbreaks. In 1895 Osaka city became the fourth Japanese urban region to construct an integrated water supply system (MHLWGJ 2008). As the city moved from the first to the second phase of the UHT, service coverage rapidly increased until the Second World War when 97 % of the entire country’s population enjoyed piped water services – a huge achievement. Although densely inhabited, Japan enjoys relatively high levels of rainfall across much of its land area, with more than 3 300 m3/person/year renewable water availability7 (Aquastat 2015). Japan also has some of the most efficient urban water utilities in the world (Hall et al. 2005). In an Asian Development Bank (ADB) survey of water in Asian cities, the Japanese city of Osaka was described as providing ‘an excellent water service’ (Corral 2007), rising well above safety and quality standards set by the country’s Water Supply Act 2002 (OMWB 2012). This performance however is now threatened by the policies of the Japanese government of Shinzo Abe (elected in 2007 on a promise to reform the long sluggish Japanese economy) and proposals from the state-owned Development Bank of Japan (DBJ) to privatise public infrastructure. The city of Osaka is readying itself to unleash the country’s first big experiment in turning a water utility into a public-private entity, a move which will pave the way for a partial equity sale of local water utilities and privatise a fundamentally communal resource over the coming years (GWI 2014) (Table 5.2). Today Osaka city has a population of some 2 782 000 people with a population density of 33 335 people per square mile (WPS 2013). As of 2010 daily water production is over 1.2 million m3/day with per capita consumption at 310 l/person/day (Aquastat 2015), which is the fourth highest in the world (Asian Development Bank 2006; Data360 2014). The Osaka Municipal Waterworks Bureau (OMWB) manages and oversees tap water and industrial water supply for the city, as well as water treatment technologies, water distribution management, leakage reduction and anti-earthquake measures (OMWB 2014). In the last fiscal year, the OMWB earned a net income of US$103 million on a revenue of US$654 million and is considered a successful, fully modern water utility (SIWW 2014). The modern Osaka water services system has significant dam and reservoir developments throughout the upper Yodo River catchment above the city. Starting with the Kunijima Water Treatment Plant, opened in 1914, OMWB has developed a large network of supply reservoirs, distribution pipelines and treatment plants, the latter built around granular activated charcoal (GAC), ozonation and post-contact chlorination treatment technologies (Fig. 5.6). The storm water and sewerage system was begun in the 1890s with the construction of brick-lined interceptor sewers (as in London and Paris) which are still in use today (as in Paris and London!). Domestic night-soil collection was still the primary method of domestic sewerage until the late 1950s (as in many Asian cities), after which human waste collection was switched over to a conventional industrial piped system. Given its available onshore resources, there has been no inclination to develop desalination as part of the water-into-supply network. As land is at a premium in densely inhabited Osaka, OWB has also incorporated green infrastructure developments, including playing fields and allotment-style gardens at many of its more spatially extensive treatment installations. The region’s vulnerability to natural disasters, especially earthquakes, means that special attention has been given to infrastructural resilience with OWB constructing vast underground ‘floodways’ as well as encouraging green infrastructure amongst domestic and industrial users to reduce urban flood risk. This sort of system integration between different public bureaucracies, in this case between water utility and civil defence authorities, is one of the hallmarks of the city’s particular version of ‘hydro-security’. However, structural change to Osaka’s water supply is imminent. In March 2015 city leaders announced a plan to auction off the water services ‘concession’ by March 2016 (SIWW 2014). The Osaka government has said that ‘partially privatising the city’s water services will promote collaboration between the government and private companies, as well as prepare water businesses to expand overseas to offset declining domestic demand’ (SIWW 2014). City officials also hope that the initiative will decrease debt and increase private investment in the coming years. These are of course the standard reasons given for water utility privatisation around the world (Staddon 2010). Privatising public services and portions of public infrastructure is not a new concept in Japan. Other Japanese cities have sold rights in airports as well as the Japanese National Railways and the Tokyo Metro, which were privatised in 1987 and 2004, respectively (SIWW 2014). The Japanese government has, over the past few years, also adopted a series of policies to facilitate private operation of public services, including water. These include a law promoting Public Finance Initiatives (PFI), a new Water Act in 2002 which enabled delegation of water services management and new laws enabling local governments to outsource municipal services more generally. In 2003 the DBJ launched a new financial mechanism designed to provide low interest funds for private companies to invest in acquiring and running municipal assets, with the DBJ itself prepared to become an equity investor holding a stake of up to 50 %. In practice municipalities have been slow to respond to the various pressures for more privatisation due in part to union opposition, as well as the fact that water services are seen by users as excellent (Hall et al. 2005). There is no grass-roots support for restructuring the water services sector. Cities like Osaka, where water is managed well by public authorities, have however demolished the argument that private sector participation is the only way to improve efficiency and even outperformed cities with prominent water services privatisation arrangements such as Jakarta and Manila (Staddon 2010). Furthermore, Osaka boasts a non-revenue water level (NRW) (an indicator of the level of unaccounted-for water and lost income due to leakages and unpaid bills) of only 7 %, which is an outstanding performance by international standards (Netto 2005) – by contrast, NRW in England is closer to 20 %. Opponents to privatisation of water services provision fear that such schemes may fail to deliver clean and safe drinking water to communities and divert resources away from rural areas to urban centres via channelling and groundwater mining (Netto 2005). However, privatisation schemes are still being pushed with vigour by international financial institutions such as the Asian Development Bank and the World Bank’s International Finance Corporation (IFC) which dominates global investment in water privatisation (Lappe 2014; Hagopian 2014), increasing its lending on water projects from US$546 million to US$7.5 billion between 2002 and 2011 (World Bank 2014). In retrospect it is perhaps unsurprising that urban water services manifest common and predictable historical geographical development trends. It would perhaps be stranger were this not the case. After all, technological innovations in, for example, wastewater treatment are transmitted through professional networks with ever-increasing speed, and as we have seen, the hydrosocial contract has evolved inexorably from an initial inkling that there was a role for the public sector in addressing water-related illnesses in burgeoning nineteenth-century cities through a period of industrial massification of water services in the twentieth century towards the current phase of both greater democratic localism (however expressed) and environmental sensitivity. The urban hydrosocial transition is however not temporally lockstep or completely uniform; different places have experienced their own versions of each of these three phases at somewhat different times. The current phase of ‘democratic localism’, for instance, is Janus faced: on the one hand implying grass-roots determination of the nature of the twenty-first-century hydrosocial contract, but on the other signalling a challenge to the previous logic of public sector water services provision. In the three urban case studies presented here, we can see clear differences in geohistorical sequencing of water services development, linked to initial starting conditions, differential economic and urbanisation pressures and, especially, different political positions on the role of the local and central states in brokering water services development. 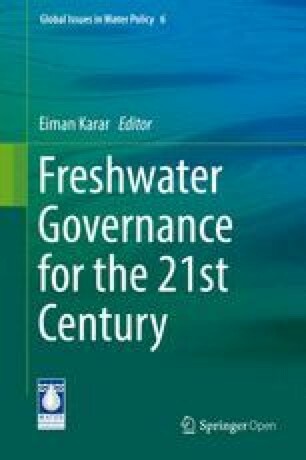 With respect to urban water governance, the key preoccupation of this volume, there are also some clear historical patterns. First, cities tend to experience an initial public health driver for the extension and expansion of urban water services. Whether in the mid-nineteenth (Bristol), early twentieth (Osaka) or late twentieth (Kampala) centuries, increasing the density of cities also brings with it a clear need for centralised command and control over public health with some level of public sector involvement in water services an inevitable corollary. This involvement can entail either regulatory oversight or direct provision or both. In British cities public health-oriented ‘Metropolitan Water Boards’ were in place by the late nineteenth century, and similar institutions appeared later in Japanese and still later in East African cities. Sometimes these Water Boards provided water services themselves (a public provision model), and sometimes they merely acted to license and regulate private service providers. Either way, the state retained a significant role in policy formation and regulation, if not direct provision. In England and Wales these functions are now exercised by government agencies charged with regulation of drinking water quality (DWI), water business planning (Ofwat) and impact on the natural environment (Environment Agency). Since the Flooding and Water Management Act of 2010, urban authorities in England and Wales have had new statutory duties for flood planning and surface water management. In Osaka, these functions are all still largely managed within the OWB, though privatisation pressures may break up this vertically integrated system from 2015 forwards in accordance with Prime Minister Shinzo Abe’s neo-liberal programme. Clearly, in Kampala, Uganda, the water services system is relatively poorly developed, particularly with respect to both wastewater and surface water management. Lack of clear government policy, political instability and economic weakness has meant that these sectors have developed primarily through programmes managed and funded by bilateral and multilateral aid organisations. Put another way, the Ugandan government has still to work out a clear hydrosocial contract with civil society, whereas in both Bristol and Osaka the basis of the hydrosocial contract has in recent years been shifted from mass service delivery towards biocentrism and resilience – alongside a shifting balance between public and private providers. Simultaneously the geographical scale of water services regulation has increasingly shifted towards the river basin or catchment, a transition that risks pitting strictly urban interests, whether bureaucratic or private, against the broader claims to manage river basins’ resources in a more holistic way for the greater good (Molle and Hoanh 2011). Yet, shifting the gaze of urban water management from cities to urban regions or river basins also allows the possibility of thinking more equitably about the distribution of water services costs and benefits from the usually more rural upper catchments to the usually more urban lower catchments. Such ‘rescaling’ of urban water governance has, for example, opened the way for considering how up-catchment land managers (e.g. farmers) can benefit from producing cleaner source waters for down-catchment cities through ‘payment for ecosystems services’ mechanisms. Yet ‘rescaling’ is also unavoidably contentious as different tiers of government vie for control over water resources whilst simultaneously shying away from responsibility for water services outcomes. In fact, the MBWs were in part a creature of the backlash against the unaccountable power, especially to tax, of Edwin Chadwick’s ‘Metropolitan Sewers Commissions’ created during the 1840s (Davis 2001). Bristol’s drinking water is supplied by Bristol Water and its sewerage services by Wessex Water, a functional split that is slightly unusual, though Bristol is not the only English city where this arrangement prevails. In fact, in a recent case decided by the Upper Tribunal of the Court of Justice of the European Union makes it clear that although private economic entities, Britain’s water companies have the legal status and responsibilities of ‘public authorities’. With approximately 6.5 million households and only 300 000 connections, this implies a connection rate of 5 % (MWE 2006). One of the MDGs was to ‘halve the proportion of the population without sustainable access to an improved water source’, though this could include such self-supply initiatives as rainwater harvesting, private water selling and NGO-brokered groundwater collection systems. Between 1 000 and 2 000 m3/person/year makes a country ‘water stressed’ – Japan is a long way from that. Asian Development Bank. (2006). Water for all: The review panel’s final report and recommendations. ADB, Manila. http://www.adb.org. Accessed 28 Apr 2006. Corral, V. (2007). Water privatization and ADB, its impacts and responses from peoples’ movements. Public Services International Research Unit, People’s Forum on ADB, Kyoto, Japan, 5–6 May 2007. http://www.waterjustice.org/uploads/attachments/1_ADB_Waterprivatization_vpc_kyoto_apr07_eng.pdf. Accessed 24 Oct 2014. Data360. (2014). Average water use per person per day. http://www.data360.org/dsg.aspx?Data_Set_Group_Id=757. Accessed 26 Oct 2014. Global Water Intelligence (GWI). (2014). Mayor set to shake up Osaka’s water utility. http://www.globalwaterintel.com/archive/14/12/general/mayor-set-shake-osakas-water-utility.html. Global Water Intelligence Magazine 14(12) (December 2013). Accessed 24 Oct 2014. Hagopian, J. (2014). Privatization of water as an owned commodity rather than a universal human right. http://www.globalresearch.ca/privatization-of-water-as-an-owned-commodity-rather-than-a-universal-human-right/5378483. Accessed 10 Dec 2014. Lappe, A. (2014). World Bank wants water privatized, despite risks. http://america.aljazeera.com/opinions/2014/4/water-managementprivatizationworldbankgroupifc.html. Accessed 10 Dec 2014. Ministry of Health, Labour and Welfare., Government of Japan (MHLWGJ). (2008). Policy and administration of water supply in Japan. Water Supply Division, Health Service Bureau, Tokyo, Japan. http://www.mhlw.go.jp/english/policy/health/water_supply/dl/policy_admin.pdf. Accessed 26 Oct 2014. MWE. (2006). Water and sanitation sector performance report 2006. Kampala, Uganda. http://www.mwe.go.ug/index.php?option=com_docman&task=cat_view&Itemid=223&gid=15. Accessed 10 Dec 2013. MWLE. (1999). 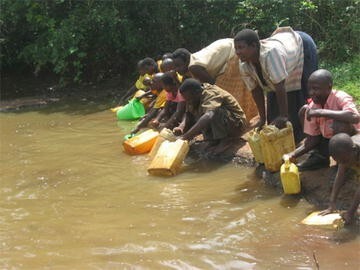 A national water policy – Kampala. http://www.ruwas.co.ug/reports/National%20Water%20Policy.pdf. Accessed 01 Dec 2013. Netto, A. (2005). World water day – Asia: Private sector still eyeing to own every drop. Focus on the global south. http://focusweb.org/node/595. Accessed 25 Oct 2014. Osaka Municipal Waterworks Bureau (OMWB). (2012). Introducing the results of FY2012 Osaka City water quality testing. http://www.city.osaka.lg.jp/contents/wdu030/english/quality/check/kekka.html. Accessed 26 Oct 2014. Osaka Municipal Waterworks Bureau (OMWB). (2014). Osaka Municipal Waterworks Bureau: Asia and Pacific Trade Centre (ATC). http://www.city.osaka.lg.jp/contents/wdu030/english/. Accessed 26 Oct 2014. Singapore International Water Week (SIWW). (2014). Osaka, Japan to begin privatizing water treatment and supply services. http://www.siww.com.sg/industry-news/osaka-japan-begin-privatizing-water-treatment-and-supply-services. Accessed 24 Oct 2014. World Bank. (2014). Water projects and programs. http://www.worldbank.org/en/topic/water/projects. Accessed 23 Nov 2014. World Population Statistics (WPS). (2013). Osaka population statistics. http://www.worldpopulationstatistics.com/osaka-population-2013/. Accessed 26 Oct 2014.